During the morning media session Premier Stelmach was asked his position on a motion that would be going before the delegates this afternoon. He answered it very diplomatically and in my opinion the way a most leaders would. He explained he would rather not give his personal position and leave it to the members to decide. He went on to say, when a leader either speaks in favor or against it may sway the membership. This is paraphrased, but conveys the nature of his position. During the lunch hour Q & A with members, he was asked about talk of a sales/consumption tax. This is also a motion in the afternoon policy session. He gave his very strong position on it stating; "There won't be a sales tax in Alberta as long as I'm premier". In less than two hours he went from not wanting to comment on resolutions up for debate, to giving a full, definitive opinion on one. It might not seem like a huge deal, but it’s these variances that cause confusion and reduce confidence. Ed is not alone in this; I’ve seen similar fumbles by nearly all the leaders. Premier Ed Stelmach responding to questions from media this morning. He appeared very comfortable and much more at ease than during his speech last night. Lunch today will include a Q & A with the Premier & Caucus for the attendees. This will be followed by an afternoon of concurrent policy resolution sessions. Just a quick list of other coverage to start your day. "....the Tories have perhaps gone from the pit of doom to the peak of false optimism." The theme for the 2010 PC AGM is “TeamPC”. There are hints of this within the handouts, the décor and in the Leader’s Address. In the main reception area there are hockey jersey’s honoring past PC premiers, behind the stage there are very simple banners with “TeamPC” and of course in the party colors. They really remind me of this……. ... except the stripes are vertical. Edited to add new photo. Thanks Joey. I will give the PC’s credit for the décor and staging; it’s simple, functional and likely reasonably priced. During the Premier Stelmach’s Leader’s Address there seemed to be several people throughout the crowd who started banging their “fan-fans” at key points. These very well could have been very dedicated supporters, but I got the sense it was somewhat staged. One of the individuals was behind me, pacing the back of the room and in between his enthusiastic moments he saw fit to chat with other people. The individuals directly around me were much more subdued. 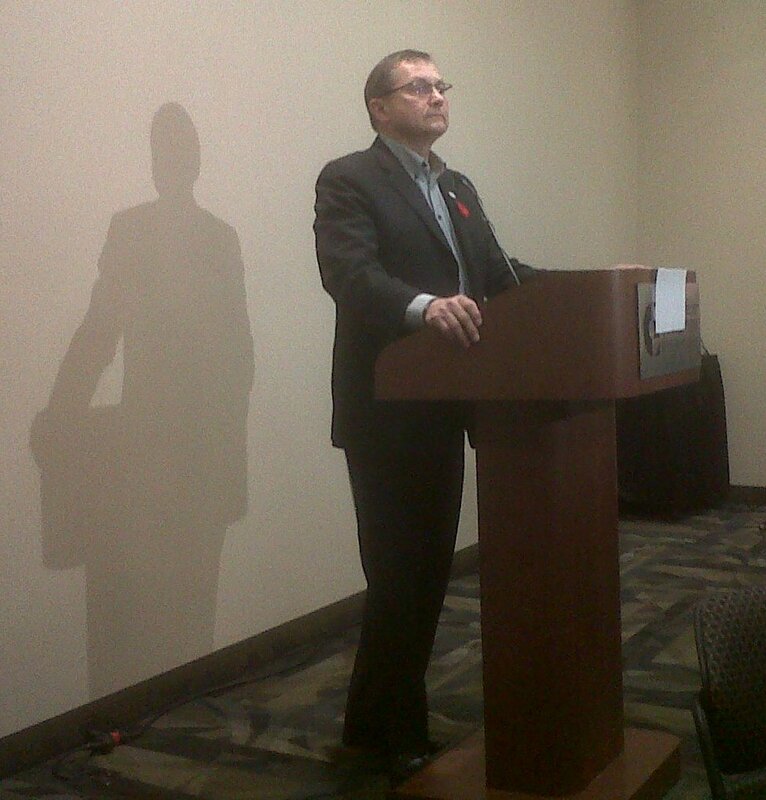 I’ve seen Premier Stelmach speak a few times over the years and I haven’t seen the changes I expected to see. He just doesn’t seem comfortable up there and appears more to be “reading” than “sharing” a vision. I don’t envy anyone who speaks to a large group; it’s one of the things I hate to do myself. Even though I don’t relish the thought of public speaking, many people have told me how much I changed in just five months of campaigning recently. Our Premier has had over two years and likely has resources, maybe even coaches available to him. I don’t know if Premier Stelmach writes his own material, but if he doesn’t I believe that might be part of the issue. At one point during my recent campaign, someone else wrote some script for me. I found I couldn’t deliver it as written; it just wasn't the way I would say it. I ended up rewriting it. I kept the base content, but added my own personality and spirit to it. He did have one moment where he clearly was adlibbing, during which he was definitely more comfortable and personable. If he could capture that and apply it to all of his presentations, they would have far more enthusiastic supporters. Premier Stelmach spoke at length about environmentalists attacking us and how Alberta isn’t being treated fairly by Ottawa. At one point he said (regarding the activists); “Nor will we give them what they want, which is attention.” It would seem to me if you use nearly 400 words on the topic during a speech you know the media is covering extensively … you are giving them attention. As for the Ottawa comments; it reminded me of the King Ralph days, when he would rattle his saber, but at the end of the day nothing changed. Also he didn’t take it to the next logical step… the How. How are they going to fix the disparity? How are they going to stop the intrusions on provincial jurisdiction? Twice during the address, he referred to the massive majority won in 2008. They seem to rely on this as if time stopped on that day; as if there has been no political change in Alberta since that day. What he didn’t address was; what are their chances of doing that again? More than one Calgary PC MLA has shared concerns with me about their chances next time around. If I’m hearing surely the members and brass within their own party are hearing it. Perhaps this is one area that is just too sensitive for the Premier to publicly admit is an issue. Right now it’s lacking in details, but on the surface it sounds like what the Wildrose Alliance has been doing all along. And truthfully, I actually thought the PC’s had a fairly democratic process in place for those who wanted to be involved. It will be interesting to see how this plays out. Today there were two other bloggers in the media room. Alex writer of The Roundhouse and Joey aka The Enlightened Savage. I highly recommend reading their coverage of the PC 2010 AGM as well. It's due to Joey's involvement that I've been granted the freedom to report on this event. Joey, I will have to find a way to get back at you errr, thank you. I would like to thank Don Braid, Graham Thomson and the other (real) media members welcoming me into their realm. Even though we (bloggers) are in their midst, our reporting of the events will be distinctly different. Bloggers tend to have a bias and in some cases even a partisan view. You will see evidence of this in my subsequent posts. Tonight's reception had several tables; each had about three constituencies represented. This was a great idea; you could head to the appropriate table to meet the MLA and/or CA representatives. I was surprised by the number of people I recognized, but even more surprised by the number of people who know who I am. I chuckled to myself when I overheard one person say to another; "Isn't she with the Wildrose? Why is she here?" One of the people I bumped into was Sean Chu. Even though we recently ran against one another, we have a great deal in common. (Including losing...) We shared post-election stories and we are both still recovering from the effects of a long campaign. Food at reception was top notch. Media room is spacious, enough plug-ins today, but think we will be short tomorrow. Beverage service was provided to media; although it seemed to have been a last minute thing rather than planned. I've decided to call this series "View from the Other Side". As background for new readers; I have a long history with the Wildrose Alliance Party. I sat on their Provincial board for over four years as CFO and Executive Director. Needless to say, it came as a bit of surprise when a member of the PC AGM Organizing team contacted me and asked that I attend as an Accredited Media blogger. So it is that a partisan Wildroser has ended up in the midst of “TeamPC”. At 4:30 today I attended business meeting of the PC AGM. It was likely the shortest of these I’ve ever been too. (Even the Alberta Party had a longer one with only 99 members back in Oct 2009) It should be noted, this doesn’t cover the policy resolution portion; which will fill the day tomorrow. By my estimation there were about 250 in attendance. This meeting had reports from the President, Treasurer and PCYA President. The following are items I felt noteworthy. Treasurer, Ron Renaud gave a recap of last year’s financials. Given this was public information back in April, there wasn't much new on this front. PCYA President, Riley Georgsen (this is youth wing of party), reported they have had success online both on Facebook and Twitter. One of their biggest challenges has been gaining members. But they are quite pleased that members are not leaving anymore. According to Riley they have about over 100 youth attending this AGM. The meeting went onto ‘new business’; which there was none. Next would normally be speeches for those seeking positions on the board; however Bill Smith advised all positions had been acclaimed. Thus the meeting was closed, not even 20 minutes after it had started. Today and tomorrow I will be at the PC AGM. I've attended other party's AGM's as an observer before, but this is the first time as Accredited Media. (New media = blogger). And the first time I've been to a Progressive Conservative one. I will be Tweeting throughout the two days. You can follow me at @Jaanikka and the Twitter hashtag for the event is #pcagm. Not sure enemy is right word. The PC's after all are our governing party and even I will admit they've done some things right.... Sshhhh. Another moving video - "It gets better"
Please share with everyone you love.